Repeating the success of our 2007 and 2008 events, in 2009 we arrange a one week tour. The 2009 Tour will include an introduction to the history of urbanism and architecture in Havana, a seminar on the regeneration of Old Havana, and a 3 day bus tour to two smaller historic towns, Trinidad and Cienfuegos. Our expert guide on both tours will be Prof. Julio Cesar Perez, Faculty of Architecture, Havana. Prof. Perez has been a speaker at several INTBAU and C.E.U. conference, is a Loeb Fellow at Harvard Graduate School of Design 2001-2002 and adjunct professor at the School of Architecture in Havana. He has lectured widely in the US and Europe about Cuban architecture. For a detailed programme and more information on the tours please click here:2009 Tour programme. Continuing our work from 2006 and 2007, international architects and planners are invited to join Cuban experts and local communities for a one week Charrette Workshop to develop ideas for the development of the Havana Harbor, and particularly for Casablanca, a small marine town across from Old Havana with 5,000 inhabitants, founded in 1780. 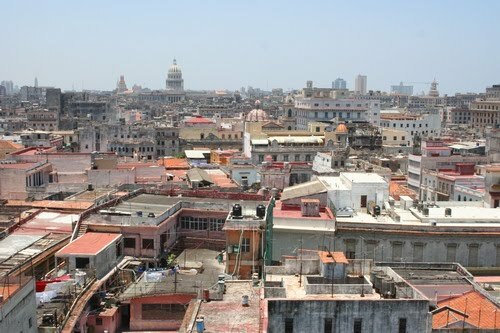 Impressions of Havana by one of our previous participants. For preliminary registration for the tour and / or the Charrette, please e-mail Claus Zapffe. Our 2007 and 2009 events had in total 70 unique participants (on average about 20 on the tours and about 25 on the Charrettes, several participating at both events) from Norway, Sweden, UK, US, Canada, Spain, Ireland and Turkey. For American participants: American participants on both the tour and the Charrette need to tavel under a general or specific license. Please see the detailed Tour programme or Charette programme for more details.